Although I am a native Welshman, I had been working for the civil service in London for 30 years when I was relocated to Cardiff. Although apprehensive at first, my wife Mary and I bought a home in Whitchurch, and we moved permanently on St. David’s Day, 1st March 1971, and it has been our home ever since. It is good periodically to retrace and recall the path we have been privileged to tread. Retrospection often brings clarity to occurrences that have mystified us for a long time past. On reflection, it is good to be reminded that ‘our lives have fallen in pleasant places’ and that we have a most beautiful inheritance – in Cardiff – our happy home! When we first came here from the metropolis of London, probably the most renowned cosmopolitan city in the world, Cardiff was a junior city, its status having been granted in 1905. It didn’t look or act like a city. Furthermore, it was only in 1955 that it was designated the capital of this small principality of Wales. In the early 1970s there was a general feeling that, although WWII had ended nearly three decades ago, Cardiff was still licking its wounds. There was a lot of demolishing and rebuilding evident. There was a lot to be done to justify Cardiff as a respectable city of stature, both nationally and internationally. Regeneration has been the hallmark and the impetus throughout the last 30 years, in industry and commerce. White-collar employment has predominated, replacing big industries’ demands. Manufacturing is now directed mostly for home/domestic market. The building industry has generally been kept busy particularly with new construction and upgrading and modernising houses. Likewise the catering industry, due to the preference for spending holidays in the UK, rather than overseas, has benefited from the changed public decision. Religion in the city has, of necessity, through falling number of adherents, undertaken a slimming exercise within traditional denominations. Congregations have united and many churches have been declared redundant. With the inward flux of new nationalities there has also been growth in new religions, and consequently, in the building of new meeting places and temples. The siting of the new Wales Millennium Centre in the docks area in 2006 has attracted new clientele to the area. It is the venue for arts and cultural events, complementing the well-established St. David’s Hall. It is also the home of the Wales National Opera and Orchestra, and the headquarters of the National League for Welsh Children and Youth – the URDD. Coupled with the establishment of the National Assembly for Wales in 2006, the Senedd, all these new structures enhance the status of the waterfront and are a marvelous advertisement to spread the name of Cardiff abroad. This city is well endowed by the Bute family (three generations), Lord Davies of Llandinam and his two spinster daughters, Roald Dahl and many other benefactors. Cardiff can boast of its Castle (as well as Castell Coch); its unique Civic Centre (arguably the best in Britain, if not in Europe); its post-war rebuilt Llandaff Cathedral (together with the remarkable statue of Jacob Epstein’s ‘Christ in Majesty’, and a completely rebuilt organ); and a greater acreage of parks and open spaces per head of population than, it is said, of any other UK city. Cardiff has an enviable history for the excellence of its educational facilities, catering from the toddler to the oldest adults, ‘from the cradle to the grave’. The university has fostered a happy research relationship with Welsh industry and further afield. For centuries the educational system was geared towards producing professionals (teachers, solicitors etc) to satisfy English demands. With the comparatively recent legal equal validity of both the English and Welsh languages in Wales, it has undeniably caused recurring problems (in staffing and administrative matters), but also given marvelous opportunities denied to the Welsh language and speakers since – and including – the Tudor period. Shopping in the city has been revolutionised during the time I have lived here. The establishment of large department stores in shopping precincts has resulted in the mass closure of the small-to-medium family retail stores. This has had an enormous social and economic effect on all the traditional villages and shopping areas. The old “corner shop” has virtually disappeared. It has also resulted in a plethora of charity shops as an alternative to a host of depressing empty shops – a Hobson’s choice for the shop owners. I remember in earlier years there were only a few instances of violence or mass-misbehaviour in sporting events – an exception possibly was when Cardiff and Swansea were engaged in a football cup-tie! But recently, such bad behaviour has proliferated. Many reasons have been advanced for this, the foremost being as stated by our Prime Minister: “cheap alcohol is turning this country into the Wild West”! The majority would agree with him, I think; I certainly do, and like many others, now prefer to worship the sport from afar and watch the games that are televised. I would still visit live rugby matches though – they are civil and well regulated. On reflection also, we have bidden farewell to all the street vendors who vocalised their wares in days gone by. The only daily visitor now is the postman and he is usually a silent dropper. The one I miss most is the daily milkman who delivered his “pinta milka day” invariably before breakfast and often before we were awake. Perhaps one the greatest of all the changes during our 30 years in Cardiff (and indeed throughout the UK) is the change in attitudes, particularly in our personal relationships. The chords that bound together families, for example, are no longer as powerful as they once were. Economic demands were possibly the first to cause this rift – when mother had also got to seek paid work, often during antisocial hours. One other constant irritation is the traffic congestion and parking facilities. The number of commercial and private vehicles on the roads has proliferated enormously and this is coupled with the poor state of road maintenance. This escalating problem will have to await another Solomon to resolve it. Meantime, I’m afraid, the holes in the roads, both the mains and the subsidiaries, will only get bigger and oftener. Would I want to move from my present home in Cardiff? The answer is a loud and resounding NO! Thirty-nine years established here surely also qualifies me not to call myself a Cardiffian, and proud of this vibrant city. I recall also when we first arrived here we received a letter, properly addressed to Cardiff, which had been incredibly misdirected to the corresponding town in the USA. It was subsequently returned to us with the astonishing red ink addition on the envelope – “Try Wales”! Now I believe the whole world is aware of Cardiff, if only because of its international sporting connections with the Millennium Stadium. It is also good to be reminded of our antecedents! To be reminded that it was a product of the 19th century industrial revolution. Were it not for the exploitation of iron ore and coal in the hinterland, Cardiff might still be a fishing village! Its remarkable wealth was the product of the extraction of those minerals from the earth’s belly at the vast human effort and sacrifices of the inhabitants of those three Welsh valleys. Yes, we should be proud of those men and women – and be grateful. I find this profound in its simplicity. Yes, give thanks where it is due – including, for 39 years of happy living in this part of Cardiff, and for the friendships we’ve found here. John Meredith Jones was born in Braichgarw, Tal-y-bont, and gave a lifetime’s service to the civil service. He currently lives in Whitchurch. 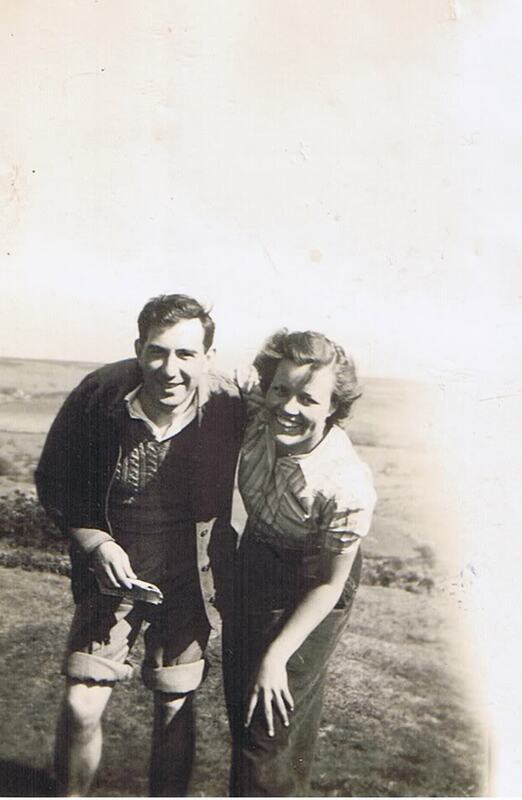 John was photographed with his wife Mary up a hill somewhere in Wales, sometime in the 1950s.